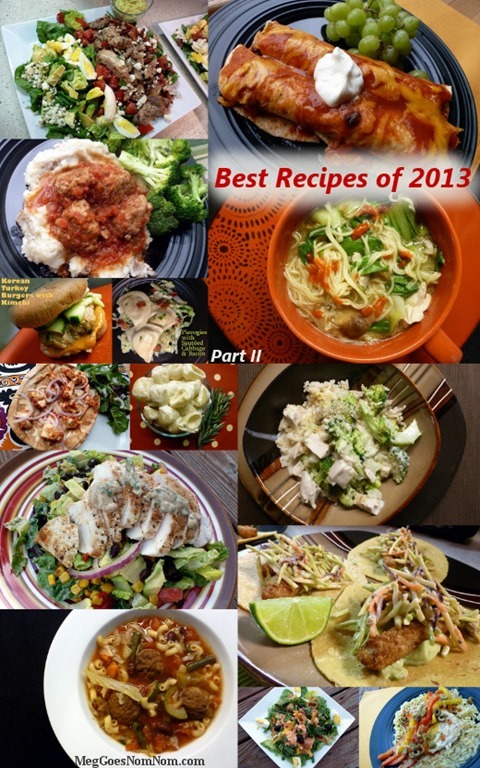 Here is Part II of my favorite blog recipes of 2013! The recipe worked well and it tasted delicious! Chicken with Rosemary, Red Bell Peppers and Olives – Salty olives and crisp, meaty pancetta pieces made the most delectable toppings for this chicken dish. 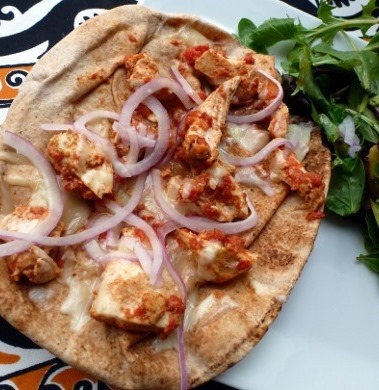 Chicken Tikka Pizzas – This pizza is such a fun variation on Chicken Tikka Masala and pizza. 20-Minute Chicken Enchiladas – These savory enchiladas come together super quickly. Cobb Salad with Avocado Dressing – The unique element of this dish was the healthy, homemade dressing. It’s a bit like guacamole in dressing form and I could eat it by the spoonful. Southwestern BBQ Turkey Meatballs – Simple, smashed redskins are the perfect vehicle for delivering the remaining tomato sauce to your face. Who needs pasta when you’ve got potatoes!? Niçoise Salad – What I love about Niçoise Salad is that it never gets boring, No two bites are the same. With each forkful, I like to compose a different combination of flavors. Egg and olives? Green beans and tuna? Potatoes and basil? Like it said, this salad keeps dinner interesting. Fish Stick Tacos – Fish sticks offer up a super delicious and easy protein for taco night! Korean Turkey Burgers with Kimchi –Miso, molasses, and Sriracha combine to create a unique and fantastic burger condiment. Make your own quick and easy “kimchi” using sliced cucumbers and ingredients on-hand in many well-stocked pantries. Chipotle Chicken Taco Salad – The best part of this recipe is the creamy zesty dressing, made with sour cream, cilantro, minced chipotle in adobo, cumin, chili powder, lime juice, and salt. I can’t get enough of the smoky chipotle flavors of this salad. Veggie Meatball Soup – This slow cooker soup is the ultimate Meal In A Bowl. I couldn’t ask for more on a chilly Sunday evening. Pierogies with Sautéed Cabbage and Bacon – I loved the pillowy soft pierogi filling paired with the crisp tender cabbage mixture. The horseradish and whole grain mustard lent a nice tangy bite to to the dish as well. 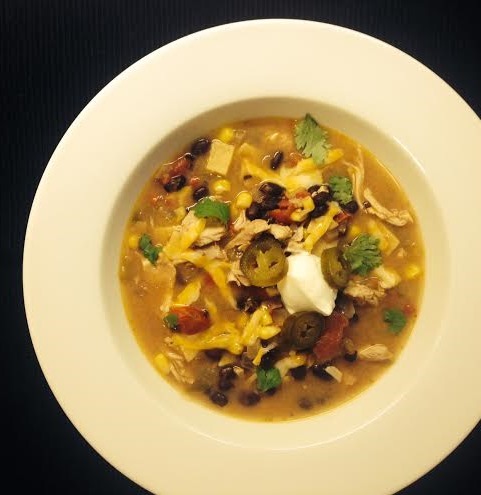 Touchdown Chili – I finally found my “to-go” recipe for the times I am craving a classic, hearty bowl of chili. This recipe is everything I want in a chili – thick, spicy, hearty – and is perfect for crisp autumn afternoons spent watching the football game. Chicken Broccoli Bake – A recipe from my undergraduate dining hall! Though the ingredient list is relatively simply, if prepared well, these simple ingredients turn into something pretty special: lush, creamy, tangy sauce, tender chicken bites, crisp-tender broccoli spears, and a salty crunch on top. Rice soaks up all of that heavenly, rich, creamy goodness. 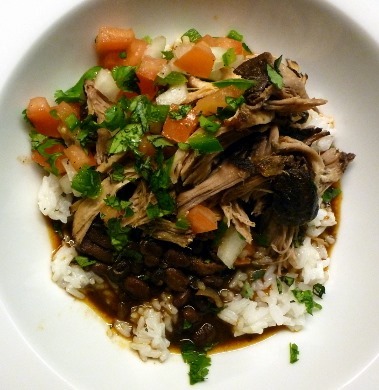 Cuban Pork Shoulder with Beans and Rice – this is pretty involved, but worth the effort! Goat Cheese Mac and Cheese – If you even remotely like goat cheese at all, you MUST make this recipe. The best part? You’ll only need four ingredients. That’s right. I said FOUR INGREDIENTS. Well, six if you count salt and pepper, but I don’t count salt and pepper. Easy Miso-Chicken Ramen – These ramen noodles are undoubtedly a big step up from the kind I used to prepare using my dorm microwave after a night out with the girls! Less bright yellow salty seasoning packets, more greens and goodness. Chicken Potpie with Cheddar Biscuit Topping – Comfort food at its best.